Travellers from some countries will need to obtain a visa before they will be able to enter Germany. Information on who must acquire a visa, and the procedures for doing so, are available from the Federal Foreign Office here. If you need a visa, we strongly encourage you to begin the process early. It is recommended that you begin the application process at least three months before your travel. Are you an IEEE member? If so, IEEE member number. Will you be presenting at the conference? If so, the paper or session you will be presenting. To what post office address should the letter be mailed? (Street, City, State/province, Postal Code, Country). We will put the visa letter in the mail usually within 5 business days. We are only able to generate visa letters for paid attendees and organizing committee members, so it is important that you register for the conference before requesting a visa letter. 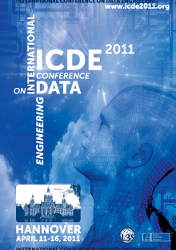 If you have any questions, please contact reg-icde2011@l3s.de.